Yes! For "Ark-Ur" fulfills all the elements which define a Bab-El. 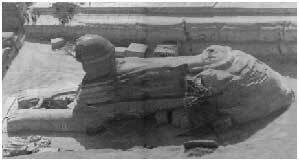 Most books discussing the "Sphinx" say or assume it is male. 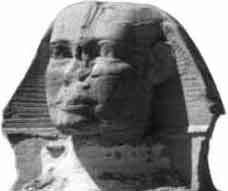 Judging from names given to it by different people, including non-Afrakans, the "Sphinx" has been regarded as both, male (as an image of Heru /Horus) and female. 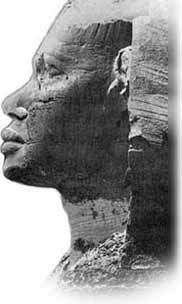 But when the vital fragments of evidence are recognized and linked, the "Sphinx's" true identity emerges as a female! 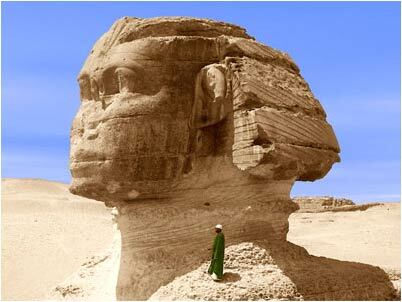 One of the best photos of the Sphinx. Its Africoid features are undeniable. HER FEMININE character is also evident. 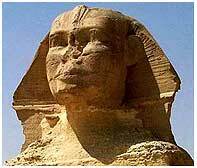 Who is the "Sphinx" ? Hathor. A monument to The Great Blak Mamma of Creation in feline form, particularly as Hathor. 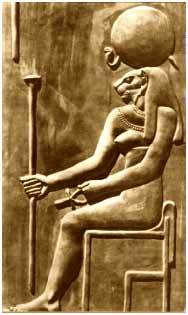 Hathor apparently has more representations than any other Kamite deity. And no wonder, for She is one of the oldest forms of Creation's Great Blak Mamma. European writers nearly always give the impression these different representations are separate independent goddesses. Not true. They are attributes of One Great Ageless Ancient Goddess, "The Great Black Mother." Hathor's many forms included the Sycamore Tree of Life, Celestial Cow from whose Udder flowed the Milky Way, Bovine Woman, Serpent, "The Great Menat", Papyrus, Lotus and a variety of WildCats. Cats were Kamit's most sacred animals. Cats were so sacred in Kamit, that any person who killed one was condemned to death. Feline forms represented only royalty. Indeed, the concept of royalty and the word royalty itself are derived from the Sun, imaged as feminine Ra-t (Sungoddess) and masculine Ra (Sungod). Hathor was sometimes called the "Eye of Ra." Cats are the most regal acting, dignified behaving, marvelously snooty animals on Earth. Kamites associated the cat with the Moon, a most adored symbol of the Great Mamma as the Queen of Heaven. The Cat was sacred to Ast (Isis), carved on Her holy sistrum. The "Sphinx" was identified with Hathor, Afrakan prototype of the Goddess of Love called Aphrodite by the Greeks and Venus by the Romans. Regarding Hathor, Wallis Budge wrote: "She was, in fact, the great mother of the world, and the old, cosmic Hathor was the personification of the great power of nature which was perpetually conceiving, and creating, and bringing forth, and rearing, and maintaining all things, both great and small. She was the "mother of her father, and the daughter of her son," and heaven, earth and the Underworld were under her rule, and she was the mother of every god and every goddess." Hathor as The Great Celestial Cow Goddess of ancient Egypt. From Her udders flow the MilkyWay....and the Nile Inundation, hence her connection with Sevak (Sirius, Dog Star). The Cow Goddess is also an image of Mehat-Weret, meaning ''The Great Flood.'' Mehat-Weret represents the waterways in the heavens. Bast: Personification of the Soul of Ast (Isis). (Bast = Ba-Ast or soul [Ba] of Ast? Soul is from SOLar. Leo is identified with Sol, the Sun). 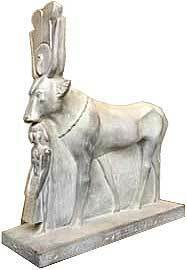 Worshipped as the Soul of Ast in the Kamite city of Pa-Bast (Bubastis), mentioned in the Bible as Pibesth (Ezekiel 30:17). Identified with Mut. Represented the milder heat of the sun. Regarded a personification of the Moon in dynastic times. Bast-Hathor: The Sphinx-Lioness, symbolizing the Destroyer. Sekhet: The Great Mamma in Her solar form. Personified the fiery energy of Nature and the burning, fiery heat of the sun, in contrast with Bast. Represented the "spirit" of alcoholic fermentation. Designated the "force or energy of the gods, astonisher of mankind." Her name also means "bee." Goddess of sweetness and pleasure, literally "Goddess of the Honeymoon." [Kuhn LL, 253] Represented in certain Kamite texts as Ancestress of Hue-manity. "Sekht, who was the ark personified, the primitive bearer of gods and men." [BB1, 449] The words CAT and SHOCK may be from Sekhet (seCAT, SHEKet). Sekhet-Bast: Goddess of Sexual Passion, saluted in The Ritual as the Supreme Being, The Only One. To Her, the eight gods offer words of adoration. [AE 250, 698] These "eight" plus Herself are the Ennead (Nine), source of the cat's legendary "nine" lives. Sekmet: "The Powerful." The lion-headed huntress or "Sphinx" who was Hathor's Destroyer aspect. Ruler of Fire and solar power, with the head of a lioness and body of a woman. Sekmet was also the Kamite name for planet Venus. Akar, Kar: Kar or Akar is an ancient name for Ark-Ur and a name of Amenta (the Underworld, the Abyss or Womb). [AE 337] Akar applies to the left side, hinder part, west and north, lower region or Hades. Akar is also a name of the tunnel leading to Amenta. This tunnel allowed the passage of the Sungod, the stars, and incarnating souls, from west (sunset) to east (sunrise). A human-headed 'sphinx' couches at the beginning and end of this tunnel; and through the paws (heart?) of these double 'sphinxes,' the manes (stars /souls) and Sungod enters on the western horizon and comes out on the eastern mount. 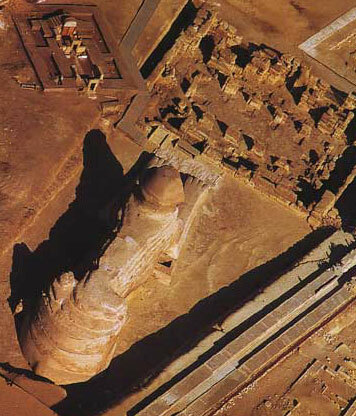 Thus, Akar was a place of burial and rebirth. "..the stars go on their triumphant course through the tunnels of the Akar" reads the Pyramid Text. Kar is also a name of the Great Mamma as the HeartSoul of Earth. Since Kamite R & L are one, then Kar = Kal, Goddess Kali with Her jet blak Self. 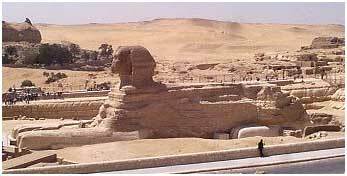 MORE: Why did Napoleon Blow Off the Sphinx' Nose?